The last two Summers Denzil the Magician has ran a successful Magic School summer camp. Teaching young budding magicians the art of magic. Every Tuesday and Thursday in May Denzil had a packed out class to part take in his one day magic. The magic school took place in Rathcoole Community Centre. Not only did the course give the kids hours of entertainment and fun. It also gave them the opportunity to meet new friends. Whilst becoming the next Harry Potter, the kids got to develop communication skills. Each student of my class earned a Magic wand and a Magician certificate from the Denzil the Magician school of Magic. As the summer camp was such a big success and in such high demand we plan on running it again in the future. Kids even enjoyed it so much they asked if they could return next year! 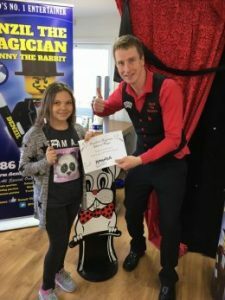 Check out the below review from a parent who had their child enrolled into the Denzil the Magician school of Magic! Keep an eye out on Denzil the Magicians Facebook page, Website or simply email me at info@denzilthemagician.com to find out more about the next Denzil the Magician Magic School. We would love to see you join us at our next course.